I distinctly remember one investor telling me how lonely he felt undertaking the task of running his super. Alone with lots of information and no one to speak with or use as a sounding board. I’d never really thought about it until this man described the challenges of making important decisions all on his own. He was right. Investing can be lonely, and it is also a deeply private and sensitive activity. So with over 100,000 people accessing Livewire each month our annual investor survey offers a rare chance to gauge the mood of other investors. Below I’ve summarised the survey results on some big issues facing investors in 2019 and my colleague Alex Cowie will be publishing the ‘most tipped’ stocks in the next day or so. Thanks to all our members that took part in the survey. I hope you a have a successful year in 2019. Rates have been static since August 2016 with the RBA holding firm at the record low, emergency setting of 1.50%. Most Livewire readers expect this pattern to hold for 2019. The latest official statement from the RBA indicated their view that low rates continued to support economic conditions in Australia. As of January, the market is pricing in a very slight bias towards reducing interest rates with a ~15 bp cut out to June 2020. 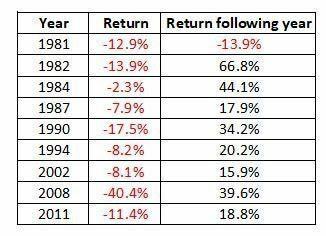 2018 was a hard year for equity investors with the ASX200 falling ~ 9.7%. Given the typically low allocation to defensive assets like bonds, most investors will be feeling the brunt of these declines. Add to that the price declines and bearish headlines on residential property and the backdrop at the time of the survey was quite negative. 58% of survey participants said they were bearish on the outlook for equities in 2019. I found the chart below interesting and while I’m sure you can be selective about the date ranges, I’m an optimist at heart and hope the market can bounce back in 2019. US v China started 2018 as a murmur started to gain some momentum and by Q4 of 2018 this was the main game in town from a geopolitical perspective. When the world’s two largest economies go head to head it breeds uncertainty. Livewire readers are not expecting a resolution anytime soon and if that is the case, I would expect this issue to remain a drag on growth assets in 2019. Last year we asked if tech stocks would fall more than 20% in 2018 (they did). This year we flipped the question to see if they could stage a recovery rally greater than 10%. Half way through January and the NASDAQ has already rallied ~5%. The majority of Livewire readers felt that a recovery of that magnitude was not on the cards. Remember last year the headlines around regulation on companies like Facebook were pretty strong – perhaps some recency bias creeping in. Readers apparently share my sentiment with 60% voting that a quarter of negative GDP print is on the cards in 2019.
Who doesn’t have an opinion on residential property? The fall in residential property values must be one of the most celebrated topics in the country. I’ve never seen so many people so happy to see asset values decline and be so open in their views. I own property and I have no doubt the paper value has fallen from 18 months ago. Even I raised my eyebrows at some of the sale prices being achieved in my area. At this time of year, you’ll undoubtedly have read numerous articles from people lambasting the futility of predictions and forecasts. Being ‘right’ is not the primary objective to this exercise, it’s interesting to gauge how people are feeling and it’s also a bit of fun to get the old grey matter thinking about a few topical issues. Having run these surveys for a few years I find they are good at capturing sentiment at the time. This can provide clues as to where investors may be heavily biased by recent information. We also make sure that we do a review of the results 12-months down the track and publish these on the Livewire website. James, I would agree in general with your prognostications. Re. the lonely investor who has to make decisions on his own with without sounding boards, it's the reason so many of us join the Australian Shareholders Association. We get together at various monthly coffee and lunch meetings across Australia and talk about issues as well as specific strategies and investments. Here's to a prosperous 2019. Thanks Gary appreciate the feedback. Alan, that's a good suggestion and we actually attended and participated in a number of ASA events this year. A friendly group with no egos and a surprisingly good knowledge of investments. I hope to get along to a few events in 2019 - thanks for reading. Thank You for raising the lonely investor issue, James. I perhaps find it more lonely as a female investor working from home in my late forties. My husband is not nearly as interested in investing as me. A lot of people I find are older than me in the investing community and interested only in investing in ‘safer’ stocks. I have only been along to one ASA meeting and attend depending on the cost and topics to be discussed. The coffee and lunch meetings sound interesting though. This is a great survey James and Livewire is such a valuable resource, well done. Investing is lonely and the pressure to get it right is immense so I'd say it's really good to have this acknowledged and put out there. Rowland, nice to hear from you and I enjoyed meeting you in Brisbane. It was great to hear your story, who knew owning garbage trucks could be so lucrative! Very pleased to hear you've been working with a good wealth professional. Livewire is a great resource but is not (and is not intended to be) a substitute for good advice. Congrats on building what sounds like a sensible portfolio and safe travels for the next 9 months. Thanks for your comment and for following Livewire. Pam, Eric and Emma, thanks for your comments and for your support. Hope you all have a successful year in 2019. Emma, we hope to hear from Miles and GVF when you have some interesting views to share - all the best. I think the last section is most interesting, in that the actual performance of a stock is not as important the expectation of how it should perform, the feeling as expressed by 'experts' and therefore no doubt influencing investors. One example - A2M reported at some point during the year that sales rose 67% - I think year-on-year - not bad at all, hey? However, as the expectation was 80%, the stock quickly fell 10%. Logical?